The rent at Tradewinds Apartments ranges from $748 for a one bedroom to a $858 one bedroom. Apartments in this building are about 13% more expensive than the Campus Farm average. This is a pet-friendly apartment. This apartment is in the Campus Farm neighborhood in Tucson. Nearby parks include Rillito River Park, Navajo Park and Rillito Park and Racetrack. 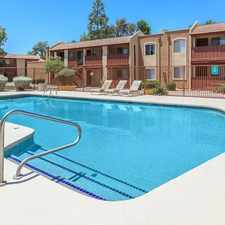 Tradewinds Apartments has a Walk Score of 62 out of 100. This location is Somewhat Walkable so some errands can be accomplished on foot. Welcome Home to Tradewinds Apartment Homes! Tradewinds Apartments is a small, charming community located just minutes north of the University of Arizona and just south of the lovely River Road shopping and dining areas of north central Tucson. Our Community has a cozy character with interiors that are a must see...we have beautiful remodeled apartments with an at home atmosphere that you will love. There are two serene grass courtyards each with a pool and picnic area. There are also two 24 hours laundry facilities at a reasonable cost. Tradewinds pays for your water, sewer, trash and gas (hot water and heat included). You pay only electric, phone and internet service. All apartments are two bedroom, one bath and are built with concrete block construction to keep the noise to a minimum. They feature large eat-in kitchens, entertainment center alcove in the living room, coat closet, linen closet, generous bedroom closet, and individually controlled A/C and heating. Newly remodeled units have gorgeous granite counter tops, new maple cabinets, ceramic tile, and beautiful new fixtures and lighting. Downstairs apartments have a small back yard and storage with your own washer and dryer hook-up. Upstairs units have a large balcony outdoor living space and private storage and washer dryer hookups in some units. Explore how far you can travel by car, bus, bike and foot from Tradewinds Apartments. Tradewinds Apartments has some transit which means a few nearby public transportation options. Car sharing is available from RelayRides. View all Campus Farm apartments on a map. Ready August 2019**Great U of A Rental, Centrally Located!! Tradewinds Apartments is in the Campus Farm neighborhood. Campus Farm is the 74th most walkable neighborhood in Tucson with a neighborhood Walk Score of 51.